Why tornadoes occur is still largely unknown but in many cases 3 conditions must be satisfied for a thunderstorm to become tornadic in the US. Firstly, there must be a warm, humid air stream from the Gulf of Mexico. Secondly, there must be a cold, dry air stream coming in from the north (Canada) or eastwards from the Rocky Mountains which meet along the dry line. Thirdly, the jet stream must be coming from the north-west at a speed of approximately 150 mph. When all of these 3 conditions are met it can start a spin in a thundercloud (Kovach and McGuire, 2003). Tornadoes are often formed from large supercell storms which are high energy systems, if a mesocyclone occurs within, a tornado may form. Tornadoes can also be formed when hurricanes make landfall along the rainfall bands due to the different air masses involved. Tornadoes are measured using the Fujita Scale proposed by T. Theodore Fujita in 1971. The scale has 6 levels of severity ranging from F0 to F5. The table below shows a simple explanation of the damage and the possible wind speeds associated with the damage. The Fujita scale is often referred to as an intensity scale but this is incorrect. The scale is a damage scale and the wind speeds are approximated from the damage observed. The scale has many downfalls which include the bias towards urban areas. 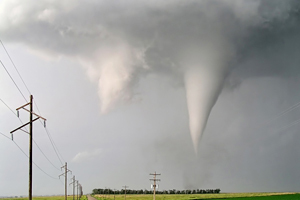 If a large, violent tornado occurs in a rural area without buildings to estimate the damage caused the tornado will be given an F0 or 1 status even though in an urban area the same tornado could cause major damage and therefore be given a higher F-rating. In recent years alternative scales have been suggested but are not currently used. To counteract the problems associated with the F-scale Dr Terence Meaden (TORRO) proposed a tornado intensity scale in 1972. The scale is directly related to the Beaufort wind scale and links in other factors other than just damage. The T-scale uses scientific formulae and allows wind speeds for even the weakest tornadoes that occur in the open countryside to be categorised, unlike the F-Scale. An improved version of the F-scale has been created and will start being applied to tornadoes in the US on 1st February 2007. This enhanced F-scale uses building and material type to become a factor before deciding an F-rating. Using the strength of the building it can be decided whether it was a strong or weak tornado and an appropriate rating can be given. An example of the table can be found here. There have been many suggestions about what to do in the case of a tornado. The places where you are most likely to be injured are in a vehicle or in a mobile home. The safest place to be is either in a basement, a reinforced room or a purpose built safe room if you have one. If you are in a permanent structure get into the centre of the building, preferably away from windows and doors as these may be broken during a tornado allowing dangerous debris to enter. If you are in a vehicle, NEVER TRY AND OUTRUN A TORNADO, this can be very dangerous as vehicles are one the most dangerous places to be. It is advised if you are in a vehicle to get out, and lie on the ground, preferably in a ditch or hollow to reduce the risk of being injured by flying debris.